SEATTLE, Wash. – On Tuesday, June 26, 2018, Firefighters were dispatched to a fully engulfed scrapped car barge fire moored at the Seattle and Iron Metal Corp. dock. The commercial fire was located in the 600 block of South Myrtle Street in the Georgetown area. The fire incident was quickly elevated to a 2-Alarm fire response bringing more Chiefs, personnel, equipment and more fire boats. The following Seattle fire resources were dispatched immediately, which they quickly engaged the fire. MRN1, FRB5, A14, E28, L3, E27, L1, L11, SAFT2, STAF10, DEP1, R1, FIREBOAT, AIR10, FRB4, A2, M1, E11, L7, B5, E6, A10, E36, REHAB1, E13, M28, PTRL4, B7, B5, MAR5, PIO, E32, E10. City of Seattle Mayor Jenny Durkan and Office staff. Seattle SPU arrived to the fire scene with their main focus on assessing the Duwamish River. 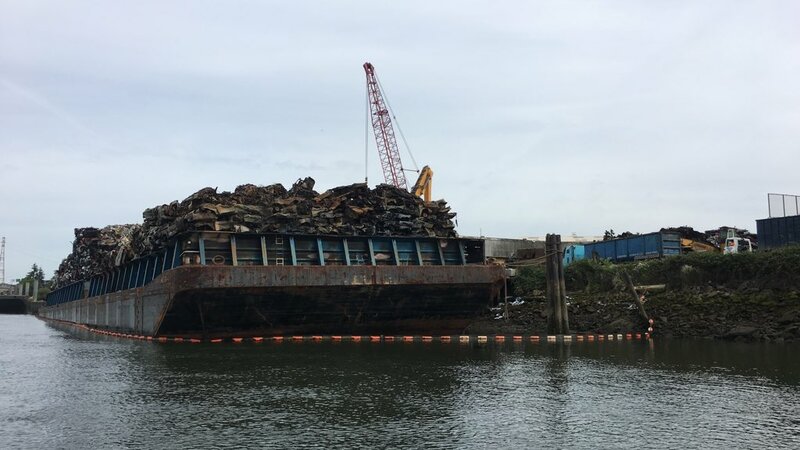 The Department of Ecology stated they observed no oil sheen and did not observe distressed wildlife on the Duwamish River on Wednesday morning, June 27, 2018. They did say there was a small amount of firefighting foam at the tide line. The barge is boomed as a precaution. Fire Investigators have ruled the cause as accidental and with damages at $1,000,000. Two firefighters were reported to have been injured after suffering minor injuries and were treated at a nearby unnamed (most likely Harborview Medical Center) hospital. Social Media became ablaze with barge fire photos being posted all over the Twitter and Facebook. Photos portrayed a huge black smoke column seen from areas such as Capitol Hill, West Seattle, South Seattle, seen on 1st Avenue South bridge, from north of the Seattle Boeing plant, Seatac Airport, Magnolia and by others on the outskirts of this large City. Want more great photos? Check out David Sonsteng, Photographer and Owner of DJ Sonsteng Photography on his Facebook Page @djsonstengphotography or on Instagram at @d.j.sonsteng.photography. 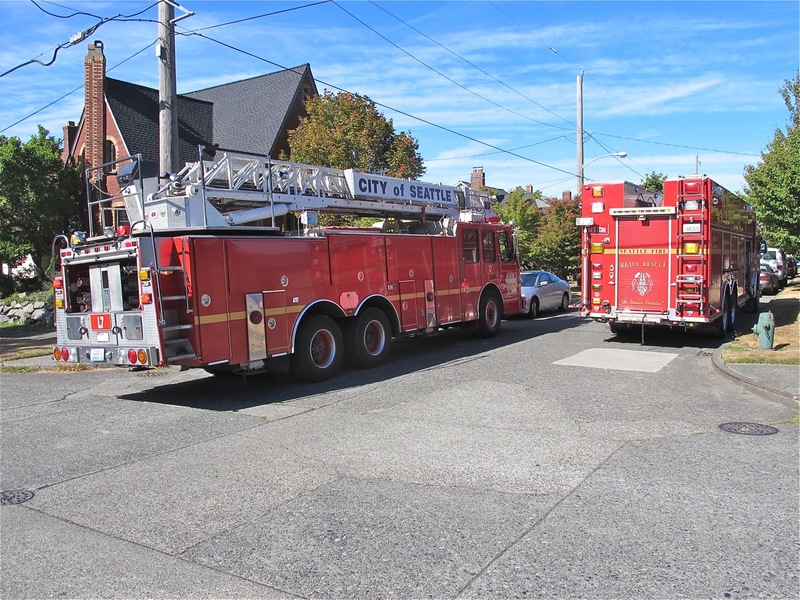 Seattle, Washington | Seattle Fire Department’s rich fire history has been recorded from year-to-year that dates back to July 6, 1876, when it was an all-volunteer company named Seattle Engine Company No. 1. It was organized by a group of citizens convinced of their own growing town’s need for a dedicated fire-suppression organization. Various fire companies were visible in providing private services until 1883 when the City Charter was amended to create and fund equipment but not staff for a centralized Fire Department. Seattle Fire’s first Fire Chief was Gardner Kellogg of the new established volunteer organization in 1889 and acting Fire Marshal in 1901. The volunteer organization survived into the late 1880’s, even during the Great Seattle Fire of 1889 which destroyed 30 city blocks and caused $12-$16 Million in damages. Soon after, the City acknowledged the part-time force did not have enough fire-suppression resources to meet their expanding need for fire protection and found itself the recipients of heavy pressure from the insurance industry and its own citizens. Ordinance No. 1212 in 1889 was passed by the Council which converted Seattle’s seven volunteer companies into a paid, professional of 32 men and into five fire districts. Decades would soon pass after the creation of the professional Seattle Fire Department bringing a rapid increase in size and resources, as well as a higher rise in its resident population. In 1890, the population was recorded at 42,000 and showing a massive increase to 237,000 by 1910. In 1891, many iconic developments occurred with its maritime fire unit inception and with the deployment of their fire boat Snoqualmie in 1891, horse-drawn resources transitioned over to motorized fire engines in 1924 and development of firefighter-staffed emergency response aid cars were implemented during the 1930’s. They were also members of the historic founding of the IAFF in 1918 and became Charter members of their Department’s union Local 27, one 218 in the organization. 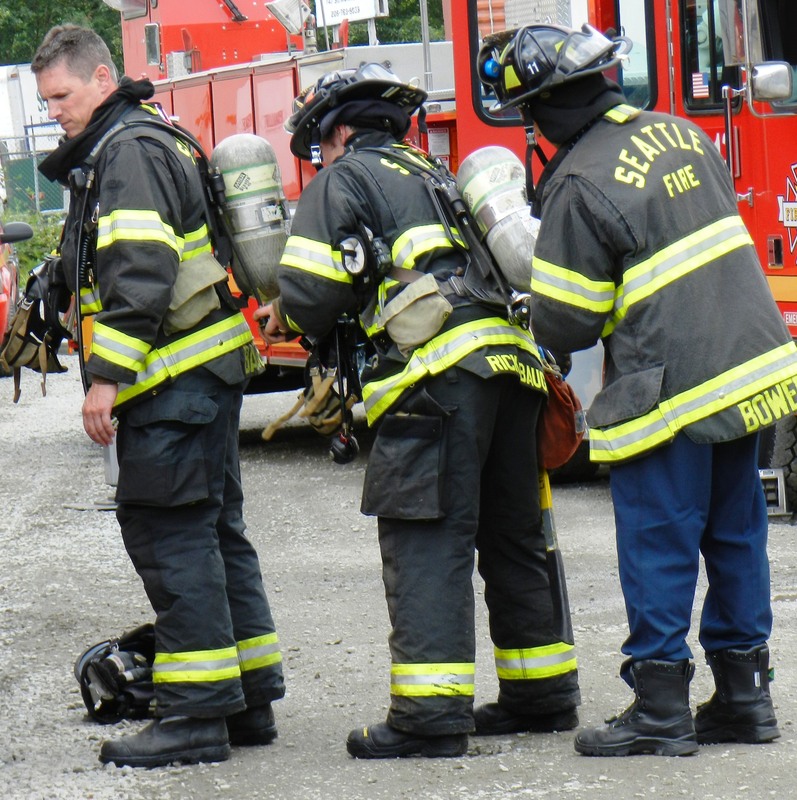 The Seattle Fire Department has moved away from just providing fire-suppression efforts as it did in its earlier days to critical services such as, building inspections, fire code enforcement, tactical rescues and public education. It is a fire-based two-tier response system providing pre-hospital BLS and ALS support services. There are six paramedic provider programs with SFD operating Seattle Medic One. The Department protects both lives and properties of their 634,535 residents and 768,000 during the day in a 83.9 square mile area including 193 miles (53 miles of tidal waters). It is listed at #22 on the Cities with populations of 100,000 and greater). The Fire Department presents itself with 981 uniformed fire personnel with 207 on-duty strength, 38 Department Chiefs, 981 EMTs, 76 Paramedics and 84 non-uniformed (civilian) personnel. Additionally, There are 34 Fire Stations (Medic One HQ at Harborview Medical Center). There are 33 fire engines including on-duty Fire Boat, 12 Ladder Trucks, 4 Aid Units (BLS), 2 Air Trucks, 4 Fire Boats and 2 Hose Wagons. Seattle Fire’s Station #36 is located at 3600 23rd Avenue SW, Seattle. This photo was taken in 1927. Presently, the station houses one engine company (E36), the department’s tunnel rescue unit and a marine specialty unit which serves the south end and in the Harbor Island/Delridge neighborhood community. It was one of 32 neighborhood fire stations that was upgraded, renovated or replaced through the fire Facilities and Emergency Response Program which was approved by Seattle voters in 2003. This facility built-in 1971 was in general fair condition but required some seismic retrofits to meet current earthquake safety standards. Remodeling to enhance its operations was also part of the $1.7 million project. Some of the great station’s features are: bay space for two fire apparatus including the marine specialty unit, a decon/clean room, maintenance work area and battery charging alcove, storage for major disaster supplies and EMS equipment and hose dryer and storage alcove. For Admin/Crew areas, there is a station office, bunker gear room, beanery (kitchen) and dining room, weight/workout room, firefighter bunk rooms, toilet/shower rooms and laundry facilities. As of 2015, E36 had 916 total responses with BLS response times of 4:38 minutes and ALS response times of 4:33 minutes. Fires were 5:52 minutes. Times have changed since then but no data is available at time of this posting. A fire broke out between buildings, an apartment complex and a single-family residence (SFR) next door. The first alarm dispatched fire units E6 A25 AIR9 B5 B6 DEP1 E25 E30 E34 E5 E8 L10 L3 L6 M10 M44 REHAB1 SAFT2 STAF10 at 2235 hours PDT. The arriving IC reported that a fire on floor one (Fire building) was racing up floors two and three, a 40×60 apartment complex and a second structure on fire. This prompted a second alarm to be called a few minutes afterwards. Units dispatched were AIR260 COMVAN E10 E13 E22 E36 L1 L7 M1. All arriving 2nd Alarm units were sent to Staging, west of 19/20th on East Cherry. Command asked for SPD to close down traffic on East Cherry. Fire between the two structures was knocked down at 2248 hours. Firefighters found a fire in the knee wall on the Delta side of the Bravo exposure and were busy digging it out. Primary/secondary searches would be conducted on both structures with nothing found. Around 2311 hours, firefighters were focusing on overhaul and confirmed power had been secured to Bravo exposure. Firefighters were also working on the roof of the Fire Building for overhaul. A cause is not known at the time of this post but we will be updating info as soon as it arrives. Firefighters were dispatched @ 1850 hours PDT to a FIRE IN BUILDING call in the 4700 block of Phinney Avenue North in Seattle (Phinney neighborhood), Washington on Saturday evening. 1856 | L8: Assigned to the roof. 1857 | E18: Laying a back-up line. Command: Floor 3 showing smoke from the roof, possibly into the roof. Asked unit to check for extension. 1858 | E21: En route with pike poles. Reported 3.5 stories and fire on Fire 3. Fire coming from the ceiling. Need pike poles. E17: Assigned to put water on exterior side and using water from E9. E16: Assigned RIT. 1902 | Dispatch: 10 minutes on the incident clock. 1904 | Primary Search: Completed on the fire floor (Floor 3). All clear. 1905 | Command: 3-story wood frame, residential building turning white and multiple crews inside. REHAB is at 47th & Phinney. 1906 | Command to Dispatch: Blocking Phinney Avenue N. Asked to notify King County Metro that street is blocked. 1909 | An unknown fire crew: Smoke is pushing from the attic. 1910 | Equipment Request: multiple 8 ft. Pike Poles are requested. 1912 | 20 minutes on the clock. 1913 | Report: Fire knocked down. 1 crew is checking extension. 1915 | Report: Fire knocked down. Marshal 5 has been requested. Interior crew to wait to do any further knock down until FIU arrives on-scene. E9: Decon line established. 1916 | E26: Exiting out of the building. 1917 | Air9: Arrived to fire. 1918 | B6: Sufficient with needs. No additional resources needed. 1919 | B6: Secondary search completed. All floors searched, Nothing found. 1922 | Back in Service: Engine 6 and Ladder 6 were put back in service. 1924 | Dispatch to Command: 33 minutes on the timer. Tap fire. 1927 | E16: RIT team reporting tap fire. Will remain in Staging. 1928 | Fire crews found the electrical panel, shutting down power to the building. North end of the fire building have been searched (secondary) on all floors are an all clear. 1930 | E9: Engine water to be used and they can now remove the supply line. A2 AIR9 B4 B6 DEP1 E16 E17 E18 E21 E6 E9 L6 L8 L9 M18 M44 REHAB1 SAFT2 STAF10 and MAR5 (FIU). The fire was knocked down at 1913 hours and a tap fire reached at 1927 hours. A Decon line was set up and all fire crews were sent through. Firefighters worked diligently to get this stubborn fire suppression, under control and contained. No civilian or firefighter injuries were reported. Marshal 5 is still on site searching for the cause. There was no preliminary cause released at the time of this post. As the Seattle Seahawks were ramping up for their game this evening, Seattle Firefighters were dispatched around 3:10 P.M. PST to a fire that broke out in the 600 block and N 59th Street. 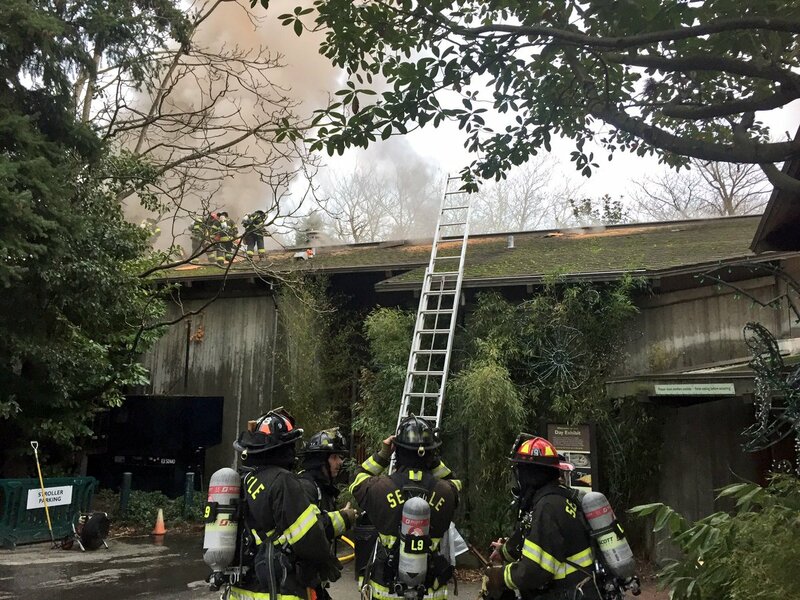 A fire broke out inside the Nocturnal building at the Woodland Park Zoo and would quickly turn into a 2nd alarm bringing many fire resources city-wide. The following were dispatched to the “Fire in Building” call at 3:10 p.m.
Marshal5 (Fire Investigator) was also dispatched to the fire scene. There is no known cause or preliminary information as to the area where the fire started. There was a report of two firefighters injured by a news media outlet but nothing official from the Fire Department sources we glean from. There injuries and conditions are unknown at this time. We hope they are okay and are on the mend quickly. No animals were said to be injured but were being moved from the fire building to a safer location. Tuesday’s weather has been a very soggy day bringing lots of rain with some reporting up to 2″ in some places, causing flooding and mudslides in Western Washington State. Already saturated by rains in the last few days, more began dumping today and not letting up until later this afternoon. By then, areas like Kent reported large flooded areas and some drivers ignoring common sense and trying to “drive” [we call it boating] across large bodies of water that seemed more like a big swimming hole. Index Galena Rd | @ MP 3 to end of Roadway | Closed: 11/9/15 – Long-term closure | Washout | Source: Snohomish County Public Works. Monte Cristo Rd | Mtn Loop Hwy to end of roadway | Closed: 4/24/15 1200 PST, Long-term closure | Source: Snohomish County Public Works. Mtn Loop Hwy | Monte Cristo Rd – White Chuck River Rd | Closed: 11/18/15 1745 PST | Source: Snohomish County Public Works. Ben Howard | 311 Ave SE – Cedar Ponds Rd | Water over Roadway | Closed: 12/18/15 2030 PST | Source: Snohomish County Public Works. Tualco Loop Rd | Tualco Rd | Water over Roadway | Closed: 12/8/15 2100 PST | Source: Snohomish County Public Works. 35 Avenue SE | 141 St SE – 139 St SE | Water over Roadway | Closed: 12/8/15 1230 PST | Source: Snohomish County Public Works. 311 Ave SE | SR 2 – Mann Rd | Water over Roadway | Closed: 12/8/15 1930PST | Source: Snohomish County Public Works. Mann Rd | 311 Ave SE to end of Road | Water over Roadway | Closed: 12/8/15 1530 PST | Source: Snohomish County Public Works. To cause additional major flooding, deep & quick floodwaters flooding some homes, roadways and much of the farm land in Skokomish Valley. Lower Columbia and I – 5 Corridor in Cowlitz County; South Washington Cascade Foothills; Willapa Hills | Expires: 12/9/15 0400PST. Central Columbia River Gorge; Western Columbia River Gorge | Expires: 12/9/15 1600PST. Greater Vancouver Area | Expires: 12/9/15 1900PST. South Washington Cascades | Expires: 12/10/15 0852PST. South Washington Coast | Expires: 12/11/15 1200PST. Yakima | Expires: 12/10/15 0852PST. Cowlitz | Expires: 12/9/15 1903PST. Whatcom | Expires: 12/9/15 1624PST. Snohomish | Expires: 12/10/15 0723PST. Mason | Expires: 12/10/15 2040PST. Grays Harbor | Expiring Until Further Notice. Bellevue & Vicinity, Bremerton & Vicinity, E Puget Sound lowlands, Seattle & Vicinity, W Slopes North Cascade and Passes, W Slopes N Central Cascades and Passes, West Slopes S Central Cascades and Passes. Additional heavy rainfall: expected tonight will lead to an increased threat of landslides in Western Washington. Rainfall expected: 4-7″ on the Coast. Rainfull expected: 5″ elsewhere in lowlands. Rainfall total expected: 1-3″ rain expected in lowlands in the next 18-hour period ending 12/9/15 1000 PST. 12/7/15: Landslides occurred in Woodinville and Edmonds. Future Expectations: More land/mudslides to occur. Around 1724 Hours PDT this evening, Firefighters were dispatched to the 3000 block of 28th Ave W in Seattle, Washington to a detached garage fire with one vehicle inside. Firefighters quickly had water on the fire and got it knocked down super fast. Around 1734 the fire was knocked down and all units except E41, E20, L6, B4, Safety 2 and Air 9 were Code Greened. The fire was said to be about 20×20 detached garage with one car inside. A preliminary report states the car fire extended to the structure. 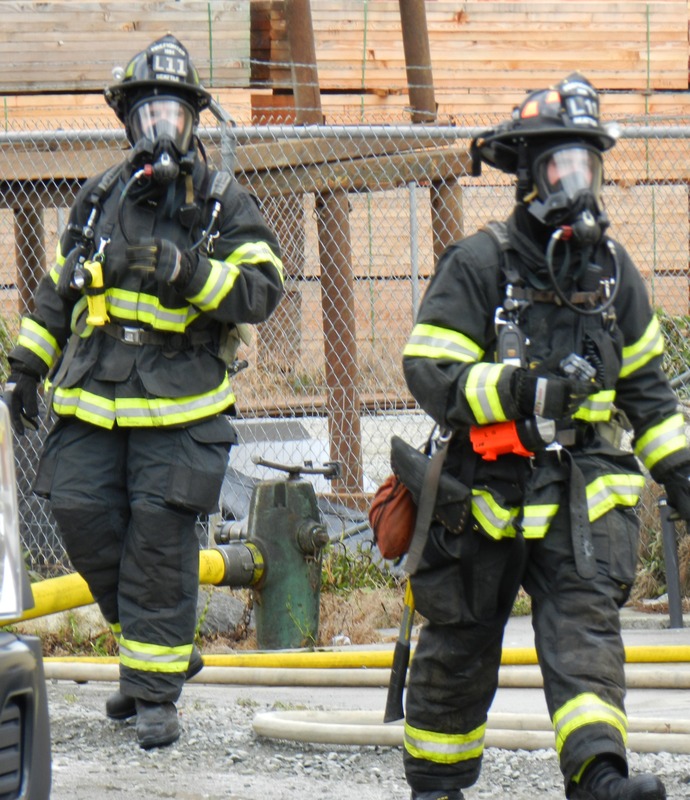 Seattle Fire’s Marshal 5 [Fire Investigator] was requested. Firefighters still remain on-scene until the cause has been determined or until released by Command back into Service.